Coming in August is a game that looks and plays an awful lot like Grand Theft Auto. Except it's on the iPhone. And it's not GTA. But it does work. Word first leaked about Gangstar: West Coast Hustle earlier this month. It's another GTA-like game coming to a platform that Rockstar Games hasn't yet graced its presence with. I played Gangstar yesterday at the New York offices of the game's publisher and developer, Gameloft. And I even found a few ways it's different than GTA. Gangstar is an approximation of Grand Theft Auto game design that puts the player in the shoes of Pedro, a man recently returned from Mexico and caught up in the violence of the game's primary locale, Los Angeles. The core car-jacking and and cop-shooting elements from the 3D GTAs are in the game; sleeping with prostitutes, I was told, is not. I played the game's intro missions and tried a flashback set in a prison yard. In my first mission in L.A. I had to find a pay phone, where I needed to beat up a gang member who said that my guy wasn't wearing the right colors to use a phone marked in blue. Then I jacked a couple of cars, learned to shoot at people, bought some armor at a shop called Bullet Time and ran afoul of the law. Later, I drove a limousine while a couple made love in the back (The game will be rated 16 and up, but it's violent, not risque). Gangstar is set for August release, but given that it is a downloadable iPhone/iPod Touch game, that should leave plenty of time for tweaks. How It's Cruder Than GTA: Sure, the game looks like GTA, but possibly due to the horsepower of Gangstar's platform, some things aren't quite as you'd expect. For example, I could drive through trees as if they weren't there. I saw a pedestrian who should have been dashing down the street. Instead, she was snagged on a park bench, running in place as if she was at a nightclub in the 90s. Any bit of polish on this kind of stuff would be great. The Police System: Do bad things and the cops will come after you, as represented by an increasing number of badges displayed in the upper right corner of the screen. These badges would go away if I hid or if I ran/drove through the game world, picking up badges strewn across the landscape. Not bad, in theory, but in my effort to evade the cops and drive to a badge marked on my mini-map, I invariably got spotted by the cops again. I couldn't shake these guys. The Controls: This game was comfortable and easy to control. It is played with the iPhone (or iPod Touch) held horizontally. The player's left thumb controls a virtual analog stick. The right thumb can tap an action icon which will make Pedro punch, kick, shoot or whatever else suits what he's armed with. Tapping the weapons icon changes weapons. Tapping the game's mini-map enlarges it. Tapping on an enemy will lock on to them so you can attack. Driving options are varied, allowing for a virtual steering wheel under your left thumb, pedals under your right — or accelerometer-based driving if you want to tilt your phone. For the most part, these controls worked very well. I was stymied only by a third steering option involving a control stick. How It's Different From GTA: The game's got a few things that GTA doesn't have, and more of that is to be encouraged. What gamer just wants to play a clone? As mentioned above, there is a playable flashback set in a prison, so we're experiencing a narrative told out of standard chronological order. Possibly more troubling for some people is the game's non-GTA-like rewarding of cash to players for every kill they make. It's not just that some downed enemies drop money, as in Rockstar's series. Nope. In this game, killing a cop or running over a civilian makes the player money. How It's Similar To GTA: The fact that a game made in the style of a 3D Grand Theft Auto can run on an iPhone or iPod touch is impressive. It shows just how capable Apple's hardware is. As a test case or proof of processing prowess, it's a positive development. Musically, the game also draws inspiration from GTA, offering four in-game radio stations or — for those with 3.0 firmware — integrating music on your phone/iPod into the game. I'm always a bit uncomfortable playing a game that so slavishly imitates another, but without having played all of Gangstar, I can't say that that is all this game is. And, if that is all it is, it's still an achievement that will probably please many who own Apple's handheld. Is this really what Rockstar would do on an iPhone? It's hard to imagine that. But it certainly has been made to play a lot like what Rockstar has done elsewhere. 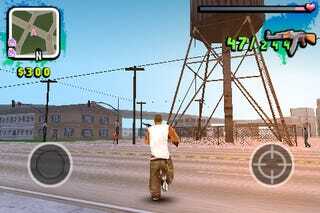 A GTA wannabe on an Apple handheld. Interested?